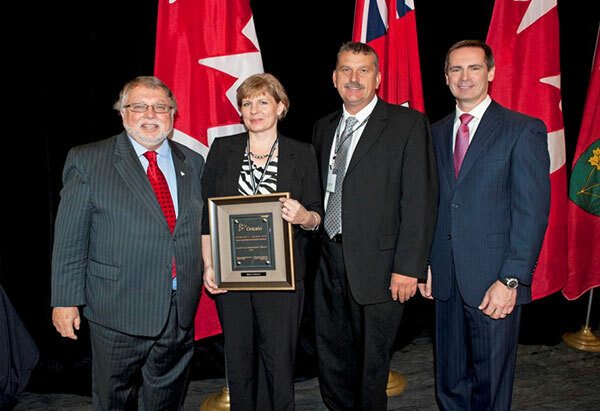 It is with great pleasure that we share with you the announcement of Mariposa Dairy as a recipient of the 2011 Premier's Award for Agi-food Innovation Excellence. Bruce and Sharon VandenBerg, owners of Mariposa Dairy received the prestigious "Leaders In Innovation Award" from Premier of Ontario Dalton McGinty and Minister of Agriculture, Food and Rural Affairs, Ted McKeekin during the official ceremony last week, adding to a long list of awards for Mariposa Dairy. This is the second time that Mariposa Dairy and the VandenBergs have been recognized for their innovation in the production of goat cheese products having received the Premier's Award in 2006.